We all know Robert Pattinson (main star of the film); some may refer to him as R.Patz. Oh no, yet another abbreviation the media like to give certain celebs. Don’t even get me started on Jedward. 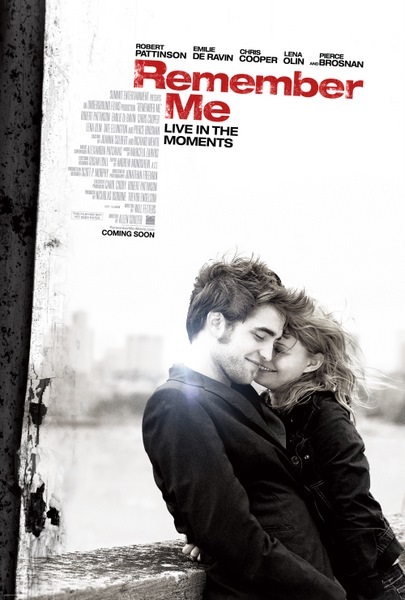 ‘Remember Me’, an appropriate title as I won’t be forgetting the film in a hurry – for good reasons! The best film I’ve seen this year, okay so I’ve only watched three – and although Alice in Wonderland was amazing, the storyline was already known, blonde haired girl falls down a hole, follows a white rabbit and meets a mad hatter (or Johnny Depp to the rest of us), so I already knew it would be good – however this film with good ol’ R.Patz (oh no I’m doing it now – we’ll refer to him as Robert) I didn’t think would be good or bad, I had no idea, the trailer looked good so I thought, why not, let’s hope it’s a good un’. Oh and it didn’t fail to impress. But that’s all I can say, if you haven’t seen it, you’ll just have to, to find out what happens. If you have seen it then you know what happens, and will probably be nodding along thinking, ‘YES I KNOW WHAT HAPPENS, I WAS NOT EXPECTING THAT EITHER’... unless you’re some kind of scary psychic or just VERY good at guessing what happens in films! Oh just to warn you, it’s not technically a happy ending, well in some ways it is, it has a good moral to the story – with the tagline to the film being ‘Live in the Moments’ – which I fully live by. Now if you say ‘YES’ and nod along with this quote – watch the film.